Ann Atwater is a black civil rights activist fighting for school integration. C.P. Ellis is the leader of the local Klu Klux Klan chapter that’s fighting for white supremacy. But in a new film, The Best of Enemies, they are forced to work together to find common ground. Crazy? On paper – yes. But as moviegoers discover in the new PG-13 film, anything is possible when God is involved. The Best of Enemies tells the true story of the unlikely bond formed between Atwater and Ellis in 1971 after a black public school is damaged by fire, forcing the city of Durham, N.C., to find new space for the students. Many citizens say the answer is integration, but Ellis and his side are staunchly opposed. Trying to solve the problem, a judge orders the city to undergo a charrette – the name for a forum in which two sides come together to try and solve problems. Charrette organizer Bill Riddick chooses Ann and C.P. to represent their respective sides. 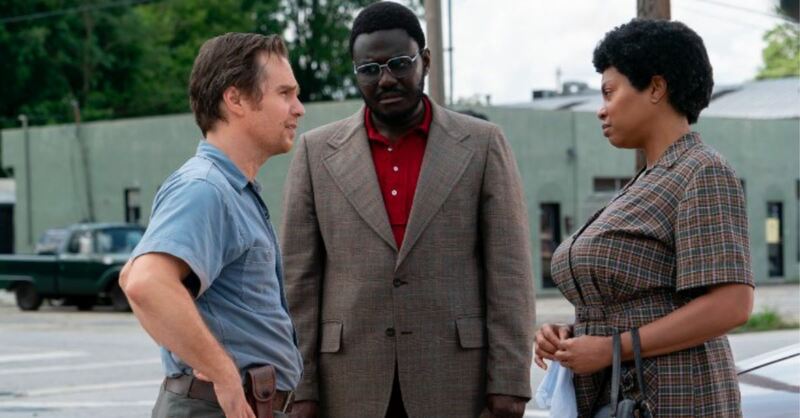 The Best of Enemies stars Oscar nominee Taraji P. Henson as Atwater, Oscar winner Sam Rockwell as Ellis and BAFTA nominee Babou Ceesay as Riddick. The film earns its PG-13 rating with strong language, including multiple n-words. But it has a strong spiritual theme, too. “Same God [who] made you made me,” Ann tells C.P. Ann Atwater is a civil rights activist who has no incentive to be kind to the leader of the KKK. C.P. hates her and, by the standards of the world, she should hate him back. But in The Best of Enemies, Ann goes out of her way to help C.P.’s son, who is mentally challenged, institutionalized and sharing a room. C.P can’t afford a private room, so Ann – without telling C.P. – calls a friend and has the boy moved to a room by himself. The real-life Bill Riddick told Crosswalk the scene is based on a real-life event. “That really happened,” Riddick said. “She did that out of the goodness of her heart. I think that was a critical part of them accepting each other.” It’s a scene that is grounded in Jesus’ own words: “Love your enemies, do good to those who hate you” (Luke 6:26). The Bible, of course, is full of stories of God doing the impossible. The Israelites crossed the Red Sea. A big fish swallowed Jonah. Jesus rose from the dead. A civil rights activist befriending a KKK leader is just the latest example. Ann and C.P. represented their respective sides as part of a court-ordered charrette. It was comprised of six white citizens and six black citizens. At the end of a 10-day period, they would vote. Each side had preconceptions about the other that crumbled as they ate together, met together and got to known one another. C.P. was impacted by Ann’s good deeds and – as the film shows – by watching her sing Gospel songs. He also realized they shared similar struggles in life. Relationships are necessary in order to change the world and in order to spread God’s Word. Jesus built relationships. The New Testament church did, too (Romans 12:10, Ephesians 4:29, Colossians 3:13). Yes, it’s possible to influence someone without a relationship, but it’s far more difficult. C.P. landed on the right side of history, but he lost a lot of friends along the way, too, as the movie shows. That’s not surprising. Jesus warned us we would be persecuted for righteousness (Matthew 5:10, 1 Peter 3:4). But Jesus also said we would be blessed. The film shows that, too. The movie is being released as society, once again, is experiencing deep divides. Riddick believes everyone can learn from it.